See what our customers have to say. . . I feel so lucky to have found the ad on the internet. I was so tired of plumbers giving me sales pitches filled with mis leading statements. Henrik's man, Willy, came out with an honest straight forward, informative presentation. I was holding my breath to hear the price of the quote. I was so excited! Not only did Henriks do more, the cost is less! They exceeded our expectations. Our job was completed in one day by five wonderful plumbers. The patching is being completed as I write this. It is excellent workmanship. I cannot even express how pleasured I am with the quality of work and the professionalism of this company. It is wonderful to be treated to the best for a fair price. All workers are very courteous and polite. The workmanship (piping and Drywall) are superb. Thank you for accommodating me on such short notice! Estimator said pipes would not go into attic, installers had to go as there was no other way without turning up a lot more walls. Our attic is full of stuff and I had to move stuff around to accommodate workers. I walked of liked to had be able to do this without having such little time. I really knew this house and asked estimator how pipe was to be routed. But he said not to worry just wish we could of discussed routing so I would not of been couth off guard regarding attic. Already recommended your services to several neighbors. Thanks for fulfilling our expectations and your promises. The water was back on bye the end of day 1. The crew showed up on time each day, and spent time to protect the flooring and furniture carefully. David and his crew made the complex repiping seem like textbook work. The patchers craftsmanship of the texture on walls make it hard to distinguish them from the repatched sections of the wall. We will recommend your work to others in our community. Thanks for the quality service!!! The crews were very hard working. They kept us informed about what was happening. They were always prompt. They were well equipped to do the job. The repiping was well done because we have had excellent results with good water pressure and prompt hot water. The workers were very courteous and made a professional appearance with clean uniforms. We are very well satisfied with our choice to use your company. A clear understanding of the project and the site are crucial in a successful and quick installation. During the site inspection we will outline the details of the project and what is included. It is important to clarify if the faucets and drains will be replaced during this part of the installation. Once the job is agreed on the system layout should be determined. This step involves ordering parts and materials for your new system. The site should be cleaned and ready for the new installation. You the customer should clean all areas around and behind your sinks, faucets, toilets, tubs and showers. We will provide you with any additional instructions if necessary. We will handle the installation of your new re-pipe system to ensure the safety, reliability and efficiency of the install. Upon completion of the installation the system is water flushed, tested and any necessary adjustments will be made. After completion and inspection, we will repair the walls and clean up the site. The customer will finish the wall with paint or other wall coverings if any. Henrik plumbing will double check our work after patching. This inspection will assure that all of the re-pipe project is completed, that the job is done to code and high quality workmanship standards. We are repiping experts, with a real shop and address (not a Suite # or P.O. Box Company). We have our address printed onto our business cards and presentation materials. We have never gone out of business, moved out of state or changed our name. We have been repiping over 30 years, and have reference letters on file 12+ years. We are not a subcontracting company, or a new up-start or out of state marketing company. Henrik has been in business since 1985, serving all of Southern California including Los Angeles County, Ventura County, and Orange County. We are true PEX Repipe experts. We have repiped over 30,000 homes, apartments, and commercial buildings. This means that when we come to your job site you have a highly experienced crew working on your project. We provide the highest quality re-pipe job in the industry, and this with a double the difference price guarantee (see details). We offer the highest quality for the best price - guaranteed! What is PEX Repiping? As the pipes of a plumbing system age, these pipes will need to be replaced because of corrosion, leaks, slab leaks, pin hole leaks, low water pressure, andrusty water. This replacement process is referred to as "re-piping." The_re-piping process is also known as a repipe job(or re-pipe,re-piping, and new piping, re-plumbing and piping replacement). Re-piping and repipe is part of the plumbing license classiﬁcation. We are licensed expert plumbers. We are experienced repipe specialists. 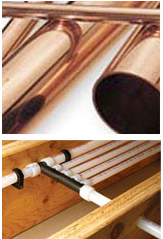 Henrik Plumbing specializes in USA PEX "a" and USA Type "L" Hard Copper re-piping. Our crews have more experience on how to install, lay out the job, order parts, and inspect the re-piping process. We have expert patching crews in house. We at Henrik Plumbing are true Copper or Pex repiping specialists. Call us today and let one of our plumbing managers give you a free in home estimate, and show you how we can repipe your home or investment property, better, and for less money - guaranteed! Take a moment to review our PLUMBERS COMPARISON CHECKLIST and you will be conﬁdent that we are the best in the industry. Unlike metal alternatives, plumbing systems are immune to corrosion and mineral buildup. Uponor PEX plumbing systems retain more neat in not-water lines and resist condensation on cold-water lines. For more than 35 years, over 12 billion feet of Uponor PEX-a tubing is installed worldwide. An Uponor PEX plumbing system dampens rushing water noise and eliminates water hammer and singing pipes. Our unique ProPEX® fitting system assures a strong connection for consistent, leak-free plumbing systems. Your Resource for PEX Plumbing Systems On Jan. 22, 2009, the California Building Standards Commission (CBSC) certiﬁed the Environmental Impact Report (ER) on crosslinked polyethylene (PEX) tubing and unanimously adopted regulations approving PEX water distribution systems into the California Plumbing Code, set to take effect Aug. 1, 2009. Now contractors and consumers ﬁnaly have access to an environmentaly superior product that wil provide a durable solution to the state's aggressive water condiions, while meeting California's high standards for drinking-water qualiy. Conducted from October 2007 through December 2008, the ER evaluated PEX tubing on is impact on air qualiy, water qualiy and performance, as wel as PEX tubing instalation, use and disposabiliy and manufacturing processes in the areas of waste, recycling, energy consumption and natural resources. In fact, milions of feet of PEX tubing are already in service in plumbing applications throughout California, due to the fact that 180 municipaliies and counties wihin the state have already approved the use of PEX tubing. To continue our mission of supplying our professional partners with building system solutions, Uponor is also launching a complete line of lead-free brass transition ﬁttings and valves that meet California lead-free legislation and exceed the requirements of the United States Safe Drinking Water Act. Combining these ﬁttings and tubing with our extensive engineered plastic (EP) offering and our innovative ProPEX® 0ut-of- the-Wall Support System provides a complete lead-free plumbing solution from the inlet to the faucet. Plumbing & Mechanical magazine recently posted an article online about Uponor‘s new microsite, www.californiapex.com, which is designed to educate and inform the plumbing industry about PEX. To read more,Click Here. News of our new distribution center in Lakeville, Minn., is spreading fast. To see an article on Plumbing & Mechanicars website about the opening,Click Here. Uponor offers several plumbing products, including our extensive engineered plastic (EP) offering and ProPEX® Out-of-the-Wall system for a complete lead-free plumbing system from inlet to faucet.